(New York, NY) – In advance of its October 22nd North American street date, Steve Hackett and Genesisfans can log on here right now to experience a full stream of Hackett‘s new double disc GENESIS REVISITED II. The set features reinterpreted Genesis classics from the period dearest to Hackett, the “golden era” 1971-1977, with a stellar array of guest performers. While making sure the spirit of the timeless originals stayed intact, Hackett enlisted the help of 35 special guests to provide the songs with a new unique edge. The star-studded line-up includes respected vocalists Steven Wilson (Porcupine Tree), Mikael Akerfeldt (Opeth), Simon Collins (Phil Collins’ son), Amanda Lehmann, Conrad Keely, Francis Dunnery, Neal Morse, John Wetton, Nad Sylvan and Nik Kershaw. Steve Rothery of Marillion and Roine Stolt of The Flower Kings and Transatlantic join in to share guitar duties, while Jeremy Stacey and Gary O’Toole are amongst the chosen drummers. Please see below for the complete track listing. GENESIS REVISITED II will be available as a 2 disc digipak via InsideOut Music. A limited number of pre-sale packages are available here. The presale packages contain the 2 discs, an autographed lithograph as well as a t-shirt. 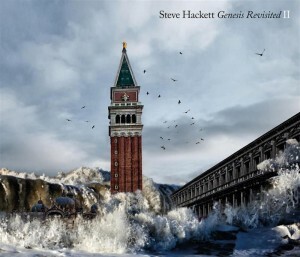 Please click here to access the GENESIS REVISTED II album cover and a new publicity image of Steve Hackett. An extensive world tour in support of the new album will be announced shortly. In 2010, Steve Hackett was inducted into the Rock and Roll Hall Of Fame at The 25th Annual Rock and Roll Hall of Fame Induction Ceremony alongside his Genesis bandmates from the classic line-up: Peter Gabriel, Phil Collins, Tony Banks and Mike Rutherford. For more than three decades, Steve Hackett has been known for his innovative tone and extraordinary versatility as a guitarist and composer. He helped define Genesis’ sound as lead guitarist in the classic line-up and went on to have a highly-successful career as a solo artist, and also as part of 80s supergroup GTR with Steve Howe.